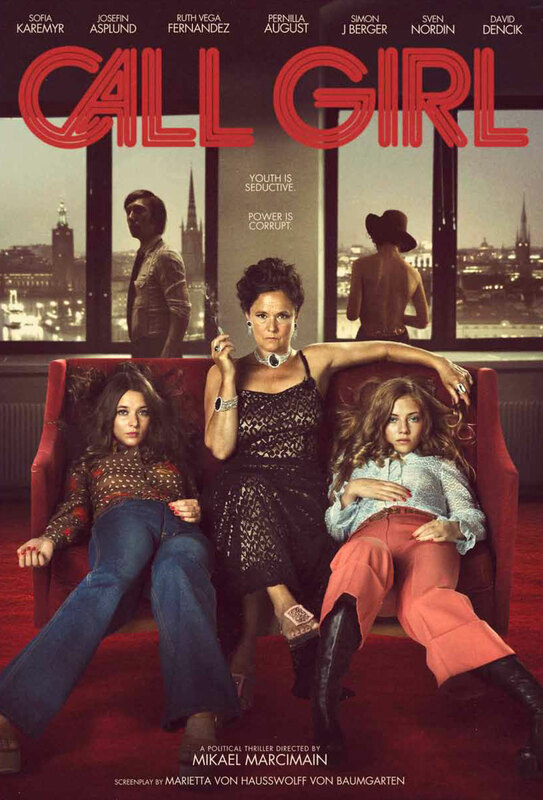 In seventies Stockholm, a troubled teen becomes a high class prostitute. Stockholm, Sweden, the mid-seventies. 14-year-old Iris (Karemyr) is checked into a home for troubled teens after repeatedly causing trouble for her single-parent mother. There she meets her cousin, Sonja (Asplund), and the two begin sneaking out of the home at every opportunity. 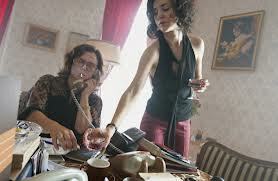 On one such trip the pair are introduced to Dagmar (August), a "Madame" who oversees a high class prostitution ring. Tempting the girls with wads of cash, Dagmar recruits Iris and Sonja. Among their rich clients are several prominent Swedish politicians who are being secretly investigated by the police. 'Call Girl' purports to be loosely based on real events that transpired in the ultra-liberal Sweden of the seventies. I'm no expert on Swedish history but the little I've read on the matter seems to completely discredit the content of Marcimain's film. Given the current global craze for Scandinavian crime thrillers, be they in the form of novels, movies or TV shows, I suspect Marcimain and his producers saw this disputed piece of history as a very marketable topic. Like Stieg Larsson's 'Dragon Tattoo' trilogy, 'Call Girl' exposes a dark piece of Scandinavian history. While Larsson's work concentrated on Sweden's Nazi-collaborating past, Marcimain turns his attention to the perceived follies of the tolerant Swedish society so many liberals envy. The film has a gripping trailer, evoking the great conspiracy thrillers of seventies Hollywood. Unfortunately the film itself plays much like a trailer, and a trailer for a film Marcimain doesn't seem all too interested in making, at that. Despite running for well over two hours, there's no meat on the bones of this story. Part of the problem is obviously down to the film being based on incidents that nobody can prove ever happened. Marcimain would have been better served by distancing himself from the purported "true" events and make a "fake true story" ala Paul Thomas Anderson's 'Boogie Nights' or 'The Master'. The director's style is indeed reminiscent of Anderson but, unfortunately, it's early, immature Anderson. 'Call Girl' feels like a bunch of what its creator considers "great moments", but they don't tie together into a cohesive whole. The film looks and sounds great. Seventies techniques, in particular the use of zoom lens, are employed to add to the period feel, and the costumes are exceptionally authentic. Mattias Barjed's score sounds fantastic, its throbbing synths reminiscent of John Carpenter, but feels out of place here and becomes distracting in many scenes. August is great, and very creepy, as the female pimp, as is Karemyr in the lead but Marcimain never lets the story settle long enough to fully explore any of these characters. The police investigation is given so much short shrift that the film would probably have profited from its exclusion. There's an interesting story here but it's one that likely requires a more mature film-maker than Marcimain to tell it.